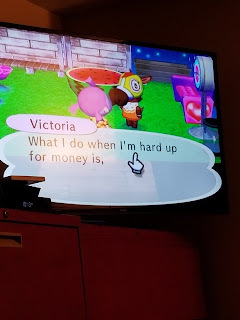 After eating dinner, I set up the Wii and went through some of our games. I tried to do the Wii Fit so we could bowl or play tennis, but the disc wouldn't play. 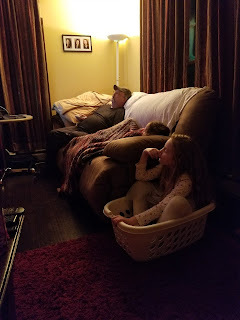 We did the Disney dance game, then I put in Animal Crossing - the girls didn't like trying to use the controllers so Pops did it while they watched. He narrated while playing and they cracked up. Rylee fell asleep while watching - at 10:30, I think that is the earliest she has ever fallen asleep at our house. Lily was not long after. Maybe dancing wears them out? Saturday morning, we had our "usual" breakfast - bacon being the most important part of it. They love bacon. I cook a pound every Saturday and they eat most of it. Along with fruit and crispy crowns. Those are the staples of Saturday morning breakfast. The other items vary - eggs, pancakes, and French toast also make appearances. We juiced some oranges and a pineapple and had fresh fruit juice as well. Mmm, it is so good when it is fresh! The girls love it, too. After breakfast was cleaned up, we made some Rice Krispie squares. 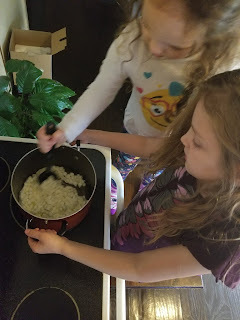 They took turns stirring - with Lily holding the pan for Rylee. They were kneeling / standing on an end table - I really need to get some step stools - my last one broke and I haven't replaced it. It wasn't long after that they went to Mimi's house to spend a couple of hours with her before going home. I spent the remainder of the day cleaning and organizing. I've slowly started minimizing the house - I filled 2 boxes this weekend for donation. I also cleaned out my filing cabinet and burned all the old documents I don't need anymore. Next 2 weeks we will only have Rylee because Lily is going on a cruise. We will miss her! How fun to see all the great things you do with the girls! They are not only learning things for their future, but will have lasting memories of you for their lifetime!